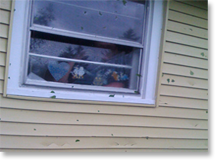 Fact - Not all hail damage is apparent to the untrained eye. 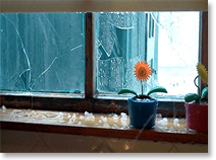 Often times, hail damage can be very subtle and very difficult to identify. 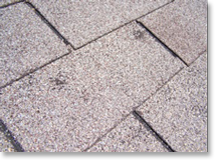 Fact - No matter how subtle the damage is, the integrity of your shingles may have been compromised. 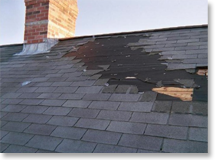 Fact - A damaged/bruised roof could lead to serious leaks/cracks in your homes roof.. Fact - Dents in flashing, ridges, low profile vents, vent stacks, power vents, pipe boots and/or turbines lower the value of your home. Fact - Quality Construction can protect your home from enduring any further damage by repairing current damage and safeguarding for the future. Was done by only an adjuster working for your insurance company. Your neighbors are having roofing, siding or other repairs done related to the storm. Your inspection was completed by contractors brought in only because of a particular storm. 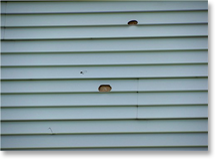 Several months have passed allowing time for routine wind, rain and/or snow to make hidden damage appear. Prior to your 180 day claim time limit. You have the inferior, non-impact resistant, no-longer made 'T-Lock' shingle. You believe, for any reason, your claim was wrongly denied..
At Quality Construction we are your advocate, in your corner, working for you. From your initial claims process through project completion we will be there making sure you get everything you deserve. 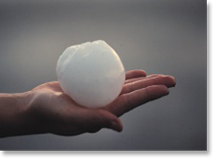 Our professional project managers are trained to spot hail damage and can often times get items added to your claim that initially your insurance company missed. Call today and see how we can help you with your insurance company! !